Even if your budget is as little as $200, you can find a cheap six string acoustic guitar with all the features, build quality and tone that you'd expect from much higher priced guitars. These four guitars not only stand above all others in their price range, but consistently wow experienced players who have spent thousands on top end Martins, Gibsons and Taylors. So, take a look at each pick, see/hear them in action and compare them side by side to confirm which is the right one for you. Note: if you're looking for acoustics you can also plug in to an amp, see the acoustic electric section. We've tried to include a broad price range, from entry level (under $100) starting on the left, rising in price to budget acoustics suited to players of all levels (up to $200). The ratings are a reflection of value for money and not a direct comparison with far more expensive guitars (i.e. $500+). Best For Beginners who want a well made, affordable acoustic with a bright clarity. Beginners or those looking for a 2nd/backup guitar with a well rounded tone. Guitarists who want a higher quality solid top with a bright resonance. Guitarists who want a higher quality solid top with strong low-mid range. Price can be off-putting, and not just at the higher end. For any guitar under $100, we're likely to seriously question the quality. But what's reassuring about the Rogue RA-090 is the number of positive reviews it's received from veteran players. We're talking Martin and Taylor owners (see video below). While the Rogue's on-paper specs are humble, the finished product is more resonant, full and playable than any other at its price point - a mere $50-$60 at the time of writing this. Beginners will have a reliable, lightweight, great sounding acoustic that will be a joy to learn on. More seasoned players will find they pick up their Rogue maybe just as much as their more expensive instruments, and leave it in the car on trips out without worrying too much about knocks and thieves. But it's evidently more than a "beater" guitar. The RA-090 sings every note with surprising clarity. It lacks the maturing depth of the more expensive solid tops, but grace it with high quality strings such as Elixirs and it'll be brought to life, with generous volume and presence. Out of the box, many users reported the action being a tad high, but as it's so cheap, a full setup will be all the more affordable and will leave you in no doubt of your purchase. A slight step up from the Rogue in terms of materials, but very similar comments have been made about fitting new strings and getting it setup in order to bring out its full potential. The more expensive mahogany back and sides give the PR-150 a deeper, fuller presence than the Rogue, although it still lacks the solid spruce of the following two picks, as reflected in the price. 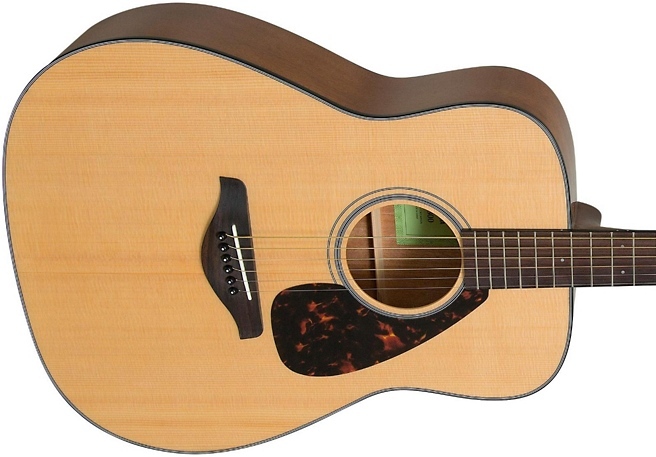 Overall, it delivers a mellow warmth with a decent punch from the mahogany backed, full dreadnought body. Fuller than the Rogue and particularly great for those driving country and blues rhythms. There's also the option of a beautiful vintage sunburst finish (pictured), if that's your thing. But it cannot be stressed enough what a professional setup will do for this guitar. Usually it's recommended you set up any guitar shortly after purchasing. But with cheaper guitars such as this one, the difference really can be like night and day, and well worth the investment. Yamaha have dominated the budget end of the acoustic spectrum for decades. The FG800 improves on their best selling FG700S - something people didn't think was possible at this price point. While the 700 was all about the brightness of the mid-highs, the 800 adds a new dimension with noticeably fuller and punchier lows, thanks in part to its scalloped bracing inside the body. In other words, Yamaha have balanced the tone somewhat, giving players a more well-rounded sound. Music to the ears of FG700S fans. The solid spruce top has been retained from earlier models and helps to add depth, harmonic response and sustain that its laminated counterparts can't attain. It's clear that Yamaha have crammed as much guitar into the $200 price as possible, and owners are frequently blown away by the quality, many claiming it to be as good as, or even better than, the far more expensive acoustics in their collection. So what makes it so cheap? In a nutshell, Chinese labour and Yamaha being the largest self-contained guitar manufacturer in the world, meaning the sheer scale of production brings individual unit cost down. There really has never been a better time to be a guitarist on a tight budget. Yamaha just keep on delivering. A strong contender to the FG800, but constructed predominantly with mahogany rather than nato, giving the CD-140S a smoother, warmer presence, which some players prefer. Unlike the Rogue and Epiphone budget offerings, the Fender's action is consistently low out of the box, meaning there's typically less need for a setup than the cheaper models. Although the mahogany places more emphasis on the low-mid range, the 140 doesn't lack volume or clarity, like with some mellower mahogany-equipped models. The quality of the mahogany is exceptional and complements the depth and crisp harmonic overtones provided by the solid spruce top. If looks mean anything to you, the CD-140S is also the clear standout of this top four, with a stunning grain pattern on the back and sides and a gorgeous tortoise shell pickguard. There's also an all mahogany version at the same price ($200) which replaces the spruce with a mahogany top, for an even boomier low end presence. With both models, it's difficult to find a bad review and Fender have proven their acoustics to be as highly regarded as their electrics.